I am a science communicator, consultant, populariser, presenter & promoter, who creates science-based public events, visits schools, and helps produce science-related television programming. My main occupation is at The University of Queensland where I work for the Aboriginal and Torres Strait Islander Studies Unit (ATSISU), where I run a tutoring programme for Queensland high school students; and the School of Maths and Physics, where I run the Queensland Junior Physics Olympiad (JPhO) and coordinate the School’s regional outreach programme. Outside of my work at UQ I run The Science Nation public events series, which tours events around Australia. After studying astrophysics in my undergraduate and honours degrees, I switched focus and tried to make superconducting plastics for my PhD, which I received from The University of Queensland in 2010. During my time as a student I was very active in science outreach, winning awards and competitions for my science outreach and communication. 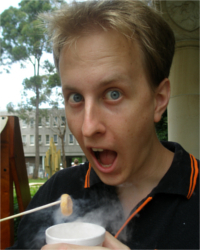 I have personally performed science demonstration shows and run maths and science workshops for over ten thousand school students all over Queensland, Northern Territory and South Australia. Through my demo shows and workshops I have been able to share my enthusiasm for maths and science with kids in every corner of the state, and was even lucky enough to take liquid nitrogen to the Simpson Desert! In recent years I have had the pleasure on working on several television shows, including Wild But True, Lab Rats Challenge and The Shak. To keep up to date with my latest science-related activities on social media by liking my Facebook page and following me on Twitter. You can also check me out on LinkedIn.